999: Nine Hours, Nine Persons, Nine Doors, AKA 999, is a game I generally refer to as either “the best game no one’s played” or “that awesome visual novel with the really long name.” While it’s easy to chalk that up to a lot of different factors, the biggest is that it’s a relatively hard game to find; it was given a small release seven years ago with almost no advertising, and as a result it’s still a rare find at used games stores and goes for quite a lot of money for a DS game of that age. Because the first entry is so hard to find, many have overlooked the Zero Escape series, which is a shame because it’s a unique mixture of visual novel and escape-the-room puzzle that features an engrossing, character-driven story that makes full use of video game’s potential for storytelling by allowing player choice. Now the first two games of the franchise, including the aforementioned 999 and its sequel Virtue’s Last Reward, have been re-released on the PlayStation 4 and the Vita with a new coat of HD paint and some other minor fixes, all of which make this both a great buy for newcomers and fans alike. Both stories initially follow a similar structure. You wake up in an unfamiliar locked room, with a strange bracelet on your arm, and have to solve a puzzle to escape. Following the first puzzle, you find yourself meeting eight strange people, all in the same boat as you, and learn that you’ve been selected for a deadly game: the nonary game. While the rules of the games differ, as do the players, both titles have the same basic gameplay: solve a point and click “escape the room” section, get to the next story segment, where characters discuss their predicament and you uncover clue to the many mysteries, and then make some decisions before moving on. Junpei is as astute as ever, and the more dialogue-focused script flows much better. After puzzles in 999, this decision is generally what room to enter next, but in Virtue’s Last Reward, you’ll be asked whether you want to ally with or betray your partner. In a classic prisoner’s dilemma, you’ll gain more points by betraying your allies, but lose them if you’re the one who gets betrayed, though allying with each other will get you a modest amount of points. As a result, themes of trust, betrayal, and desperation are central to the struggles of Virtue’s Last Reward, whereas 999 is more of a straight “whodunnit” with some paranormal elements. Back to 999, this is probably the main reason most people will be interested in the re-release. Not only is it the harder to come by of the two, as Virtue’s Last Reward has been available digitally and physically for some time now, it’s also the one that’s been given the biggest overhaul. Visually, environments are more detailed, with more animations, and the character sprites no longer have that slightly pixelated, original-trilogy Ace Attorney look to them. The puzzles are fun overall, though some of 999’s get a little bogged down in high level math problems. But the main draw for a lot of people is going to be the inclusion of voice acting, which is really well done. In this game where a lot of people have more going on than initially appears, accurately portraying them requires a very nuanced performance, and the cast delivers on this, with Sean Chiplock as the tough, abrasive Santa and Richard Epcar as the quiet, reserved Ace being two standouts. It’s a bit of a shame that the escape the room segments aren’t voiced, but considering that later titles don’t voice those segments either, it isn’t surprising, even if I really wanted to hear Snake sing the ballad of the well-organized man. One other thing I loved about the voice acting was that none of the character with existing voice actors from later titles were recast, with Wendee Lee, Evan Smith, Rena Strober and all returning as Clover, Junpei, and Akane respectively. While I wasn’t a huge fan of Lee’s performance as Clover in Virtue’s Last Reward, she gives a much different take on the younger Clover, and it’s nice to see that Aksys Games went out of their way to keep the cast consistent, especially considering how the games industry as a whole has a nasty habit of replacing voice actors between games. The game has also been rewritten a bit to take advantage of the voice acting. Compared to other visual novels, 999 for the DS wasn’t especially heavy on dialogue, and frequently used long paragraphs of description instead of conversation. This has largely been excised from the remake, which instead uses new dialogue between characters to further highlight the voice acting. While there is the option to play the game with all of the original text intact, the new, dialogue-heavy version of the game feels much quicker, and generally flows much more nicely. Phi, accurately describing the game as a whole. Another addition to 999 is a feature lifted from Virtue’s Last Reward: a flow chart tracking your progress through the many paths the story can take. You can jump to any point in the story using this chart, provided you’ve been there once before, which means you can go back to any decision and make a different choice rather than having to start the whole game over again. As someone who played the original game through five times to see all the different endings before finally giving up and using a walkthrough to find the “true” ending, I definitely appreciated this feature, and I’m sure a lot of other people will as well. As much as I love the original game, playing through the same puzzles that many times to see each ending was a bit tiresome. Before I move on to talking about Virtue’s Last Reward, I’d like to venture into some slightly spoilery territory with my one major criticism for the port of 999. While both games have their fair share of twists, the ending to 999 is one of the series’s best, as it’s foreshadowed throughout the game in some very subtle ways. However, part of the reason that the final twist worked as well as it did was that it made use of the DS hardware in a particularly interesting and unexpected way. While a lot of steps have been taken to preserve this twist, and for the most part they work, but it still doesn’t hit quite as hard as it did on the DS. This is, admittedly, a really small nitpick with what’s otherwise a vastly improved port, but it was a little disappointing if completely expected. If it seems like I’ve been neglecting Virtue’s Last Reward in this review, there’s a reason for that; not much has really changed from the original Vita version to the PS4. 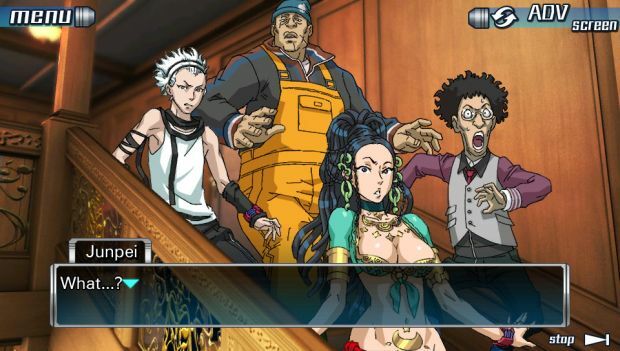 The textures looks a little cleaner, but otherwise, the two major additions to the port of 999, the flowchart and the voice acting, were both features in the original version of Virtue’s Last Reward. The cast of characters in both games is great, barring one annoying mascot character. It’s still an incredibly solid game, as well as the longest game in the Zero Escape trilogy. While 999 goes for multiple small plot twists leading up to one big one, Virtue’s Last Reward is a game full of big twists, and it goes full-on science fiction in the late game. It’s a bit wackier and weirder than its comparatively grounded predecessor, but its puzzles are designed better, and don’t have the same reliance on high level math as 999. Not only that, but it’s still a masterclass in characterization, with each of its nine story endings focusing on one character in particular. After all these years since I first played it, Quark and Luna’s endings still manage to get to me, and the third act is full of gut punches. If I have any complaints, it’s that the villains of Virtue’s Last Reward aren’t as well written as in 999, which boasted a strong villain who gave a terrifying performance in all endings, and Zero the Third, the AI Rabbit who presides over the second nonary game, just screams “forced mascot character” whenever he’s on screen. He seems like something an executive forced the development team to include in an attempt to copy the success of Danganronpa’s evil teddy bear, Monokuma He never fits the tone of the game, his appearances are brief, and he’s mostly confined to the first two hours of the game before disappearing with the barest explanation, so it feels like the even the writers were trying to forget about him as soon as possible. Zero Escape: The Nonary Games is the best way for you to play two of the most frequently overlooked visual novels out there. The additions to Nine Hours, Nine Persons, Nine Doors bring new life to a underrated gem, and Virtue’s Last Reward is still as close to perfect as it was when it was first released. If you want to experience two of the best stories from the last generation of handhelds, this is the best way to do so. Streamlined dialogue is nice, and the option to play with the original translation is great as well.